For the last few months, I’ve been working with a social giving website called One4All, first helping start their online presences, and now acting as an advisor. One4All Members can donate to any US-based 501(c)3 organization and the non-profit receives the full amount (unlike other sites that may take 5-7% from the charity). It’s free to join, you can donate to your favorite non-profits, support friends’ causes, and create your own fundraisers. Your account saves your donation history forever. Bill Gates and Warren Buffet and friends can make Billionaire Giving Pledges. We’re not them. But we can make a difference, as a community, to any nonprofit we set our mind to support. Why am I writing this? One4All selected a handful of friends to test out the power of social giving. I get $5 loaded into my One4All Fund for each friend I invite who creates an account…up to $1,000! I will take the sum of these $5 kickers and donate it to Autism Speaks, the National MS Society and The Connecticut Challenge for Cancer Research. These are 3 charities I care a great deal about. 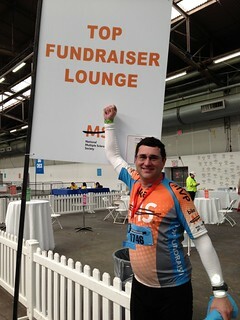 I bike for MS every year to honor my sister Jamie. My friend Cindy introduced me to the CT Challenge last year, and they do fantastic work raising money for cancer research. And my friends at Autism Speaks are about to “Light it Up Blue” on April 2nd – and with 1 in 88 children on the autism spectrum, they could use the help. While we have until late April to get the $5 kickers from One4All, let’s make this happen in 10 days. Move over Bill and Melinda. I want action, results, and commitment from 200 people by April 8th. 20 people a day, $5 a person, let’s get a movement going. If you want to be extra cool, Donate to my fundraiser “Howard’s Philanthropy SmackDown” and choose to support Autism Speaks, National MS Society or The Connecticut Challenge for Cancer Research. I will pool the $5 kickers with your gifts into a combined donation to these 3 organizations. Think about how awesome it feels to get an unexpected gift. Think about how much time and money it takes a non-profit to fund-raise. Now think about giving a non-profit an unexpected gift they didn’t have to spend time and money to get. Powerful stuff. Create a free One4All account. I get $5 in my charity fund by your action of simply joining. Donate to my fundraiser (if you feel inspired to do so) – One4All takes a very small percentage for paypal’s processing fee. The rest goes to your charity. The process is transparent. I will donate the grand total of all $5 kickers to these organizations. Make sure you use one of the links in this post so my account and fundraiser get the credit. Hat tip to Betsie from @one4All for some of the copy in this post.